It's Saturday night, and it's been quite a week! I have developed a very strong dislike for moots here in Malaysia, especially in Sibu. I know they have their place, but they just spring out of nowhere and drivers don't seem to care about any driving rules at all. They dart in, out, in-between, and around cars. Scary! I had a close encounter with one Monday afternoon on our way home from somewhere. It was pouring cats and dogs. A moto came out of nowhere as I was going around a roundabout. He slid right into me. We stopped about 100 feet ahead to catch our breath, ready to take care of business. 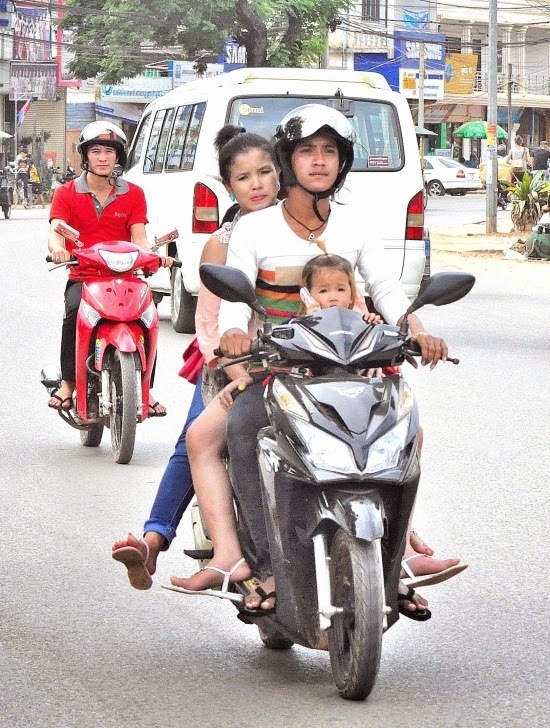 When we looked back, the moto and driver were gone. No injuries on our part, nor the driver's since he had disappeared. Motos are all over the place. They even take their families on them. I found this picture on the internet so you can see what I'm talking about. Needless to say, I've been a little gun-shy about driving. I'm getting more relaxed about it, especially after making several trips to the airport to drop off and/or pick up missionaries. I've gone several times this week, even driving by myself. Thank goodness for GPS! Tuesday we attended our first District meeting. We held it in our home. Sister Bodell fixed tacos for everyone. 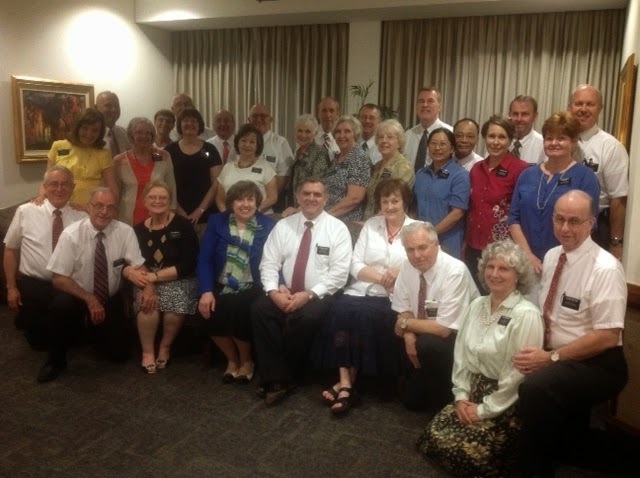 There were 14 Elders and two senior couples. 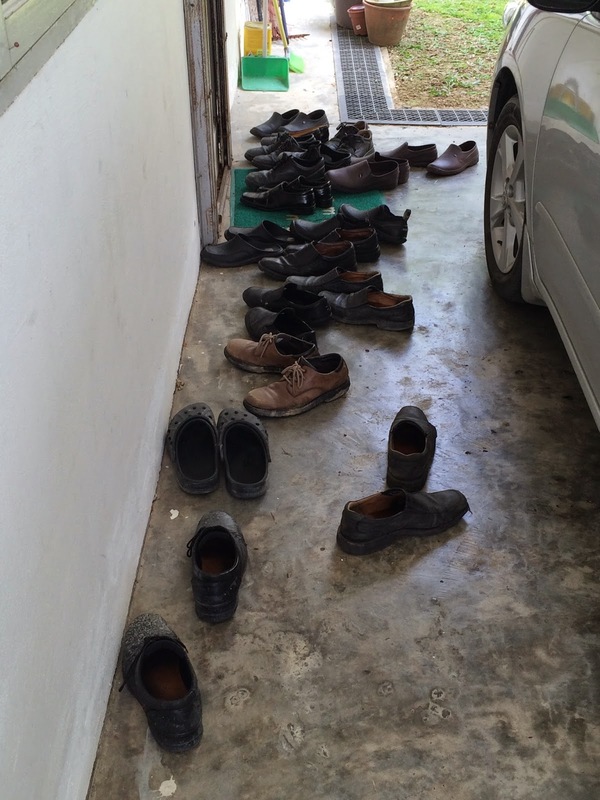 I love the fact that wherever we go, members' home or church, everyone takes their shoes off. Wednesday and Thursday were pretty much involved with the usual day to day of study, shopping for supplies, find our way round the city. I think it was Wednesday night that we went out to dinner with the other senior couple in our district, Elder and Sister Mills. We had a great time talking and getting acquainted. This is their second mission. We've had several days of rain . . . I should say daily. Sometimes it just pours. Somewhere I have a picture of the rain. I'll include it next week. 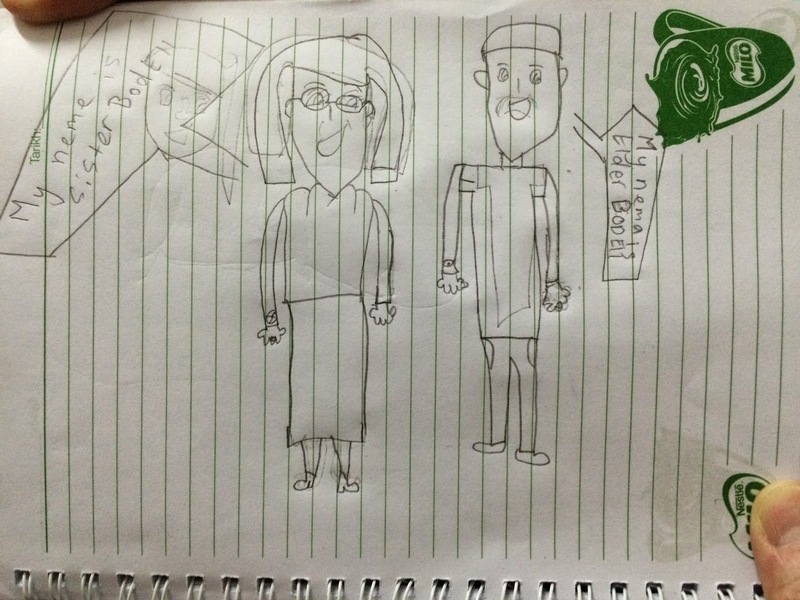 A drawing of Sister and Elder Bodell by Olivia, President Gara's daughter. Today is Saturday. I drove out to the airport by myself to pick up four Elders. They had been to a new missionary training. I got them home safely and without too much consternation on my part. 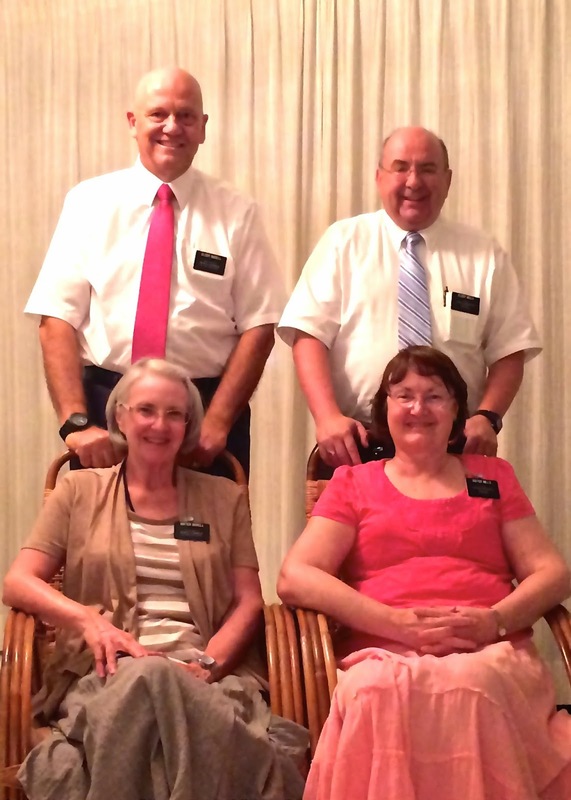 We went over to the Church at 2:00 P.M. so Sister Bodell could begin teaching piano lessons. She had three students today. That will grow next Saturday. I taught my first Seminary lesson at 4:00 P.M.. There were four students today, along with two missionaries who helped translate for me. The lesson went well, and I felt the Spirit as scriptures were shared by those in the class, even as they read in Malay. I'm grateful for this experience. The District President is supposed to call a teacher from the local membership. I may end up teaching for several weeks. The Seminary and Institute classes coincide with the local school year which runs from January to mid-November. Here are some pictures that I hadn't posted yet. 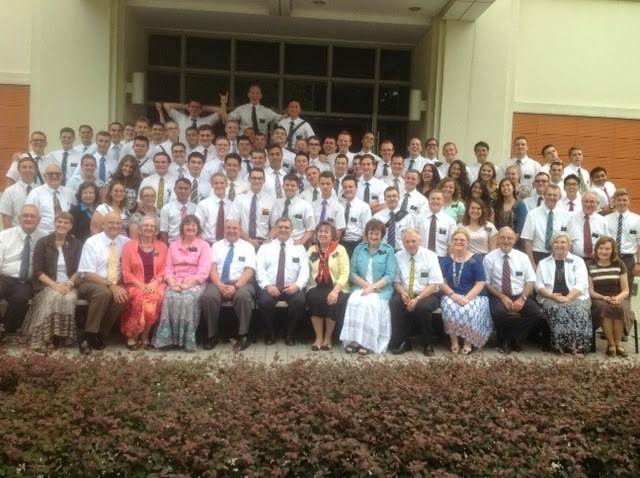 The first two were taken at our missionary conference last week. Our Zone Conference. How we got front row seats I'll never know. President and Sister Mains are seated in the center. Tomorrow doesn't really start a new week in Malaysia. Their weeks go from Monday to Sunday so tomorrow is actually the last day of the week, but I'm still on US time. Tomorrow is the beginning of a new week for us. There is probably much that I haven't included in this blog, but I can't remember what else at this time. It may get included next week.